Accordingly, Cydia is a full-featured graphical front end to APT and the dpkg package management system for the iOS developed by Jay Freeman (saurik). These default repositories feature tens of thousands of software packages both free and commercially sold through the Cydia Store (similar to Apple’s App Store). 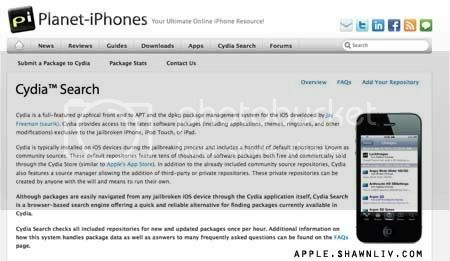 Cydia Search is a browser-based search engine offering a quick and reliable alternative for finding packages currently available in Cydia. Cydia Search checks all included repositories for new and updated packages once per hour.